Here are eight practical, easy ways to save real money now by making small, daily changes. Put together, they can add up to $1.7 million in savings over the next 30 years. A family of four can save $1.27 million in real money in 30 years by eating less in restaurants now. It looks amazing, but is it worth a half a million dollars? 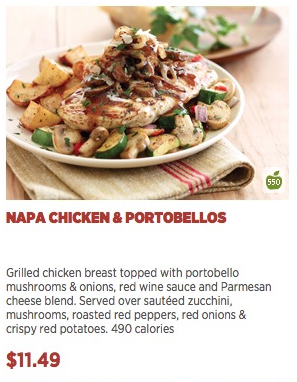 Applebee’s Napa Chicken & Portabellos entree costs $11.49. Throw in an entree for the spouse, two kids’ meals, an entree, drinks, dessert, tax and tip and the cost of a family meal can hit $100 without breaking a sweat. Repeat that once a week and the restaurant spending category becomes $400 a month. Compare that to $15 spent on chicken, rice and vegetables at the supermarket and cutting out the weekly restaurant trip saves $340 a month right off the bat. Invest that money at 8% for 30 years and build a savings of $499,000. Wake up to another half million dollars saved. Someone who grabs a McDonald’s breakfast on the go each morning can save $15 a week on a sausage McMuffin and an orange juice. If Mom and Dad both cut out drive through breakfasts, that’s $120 a month. Also, bring lunch to work and cut out $15 restaurant lunches twice a week to rack up an extra $240 a month. Invest it under the same plan as above and that’s another $528,000. Between breakfast, lunch and dinner, cutting out restaurant meals can save $1.27 million in 30 years. A family of four can save $101,000 in 30 years by lowering insurance rates just 5% or 10%. A family of four in West Virginia can easily pay $925 a month for a health insurance plan with a $1,000 family deductible. Shopping around and finding a plan that saves just 5% could turn up a savings of $555 a year. Car insurance and home insurance prices vary greatly depending on several factors including state, type of car, and size and value of the home. However, the average car insurance premium in the U.S. is $150 a month, and the average home insurance bill is $952 annually. Shopping around for policies that save 10% on car and home insurance bills can turn up a yearly savings of $275 or more. Between health insurance, car and home insurance, there’s a possible savings here of $830 a year, $24,900 in 30 years or $101,000 if the money is invested at 8%. Selling unwanted stuff on Amazon is a great way to scare up extra funds. Selling unwanted items annually could turn up $73,000 or more over a period of 30 years. Most people who move to a new house after even five years are astounded by the amount of possessions they’ve accumulated. In many cases, going through a basement, attic, closets or other storage spaces can turn up a decent pile of unused goods that could be converted into ready cash. Someone who needs cash on short notice can spend a Saturday looking for used items that might sell well on Amazon or eBay. Electronics, used smartphones, computer equipment, sporting goods and small home appliances can all be resold for cash online. Read: Amazon vs Ebay: Where Should I Sell My Stuff? Items that are harder to resell online like glassware, clothing and large items like exercise machines and furniture might sell better in a yard sale. Yard sales are bigger business than many people realize. The weekly national revenue from yard sales is estimated at over $4 million. The best day of the week to hold a yard sale is on Saturday, and the best time to start is 7:00 am. The top three best loved items in yard sales? Tools, collectibles and sports equipment. The top three most hated items? Magazines, televisions and stuffed animals. A typical yard sale can pull in anywhere from $200 to $500. It’s hard to estimate the earnings on selling used items online, but we’ll plug in a figure of $300. Doing a spring cleaning like this annually not only frees up storage space, but it can pull in $600 a year, $18,000 in 30 years, or $73,000 if it’s invested at 8%. Knocking a few points off a credit card’s interest rate could save $122,000 or more in interest charges in 30 years. Lowering interest rates on home and auto loans takes refinancing, which means time. By contrast, trying to get credit card companies to lower rates only takes a phone call. The typical American has at least $7,000 in credit card debt. Those with any credit card debt at all are likely to have over $15,000 in debt on cards. The typical interest rate on credit cards is 14.9%, and cards with rates of 22.9% or higher aren’t at all uncommon. Someone with a $15,000 credit card debt burden who gets their interest rate lowered from 22.9% to 14.9% will save over $1,000 a year in interest charges. Invested at 8%, that’s $122,000. To negotiate a better credit card interest rate, just call and ask. To strengthen your argument, shop around first and find a card with a lower rate as leverage. A credit card company will be more likely to lower a consumer’s interest rate if they think they’ll lose the consumer’s business otherwise. Finally, be persistent. If one customer service rep says no, thank them, call back and ask another one. If that fails after three or four tries, ask to speak to a manager. Canceling recurring payments could provide $14,000 or more in savings over 30 years. Gym memberships, dating services, Hulu or Netflix subscriptions, magazine subscriptions and credit monitoring services are all examples of recurring payments that keep going unless a consumer cancels them. Going through a credit card statement once a month can catch recurring payments for service that are no longer being used. Recurring payments often go unnoticed because they can be small. A Netflix streaming subscription costs just $9.99 a month, but that’s $119.88 a year, or $3,596.40 after 30 years, or $14,666 at 8% interest. Lifetime savings for dropping cable: $132,000. Cord cutters are saving piles of money. According to the FCC, the average monthly bill for basic cable in the U.S. is $64, but prices can easily run to $100 or higher. Switching to a Netflix subscription or other similar online streaming service can drop the monthly bill to $9.99 per month. That’s a savings of $90 a month, $1,080 a year, $32,400 in 30 years and $132,000 invested at 8% interest. Lifetime savings for switching to a prepaid phone plan: $95,000. A prepaid phone plan can save 30% or more on a monthly smartphone bill. Prepaid phone plans used to be an option for those with bad credit. They used to have poor coverage and come with a limited selection of phones. Now things have changed. Prepaid phone plans generally get good coverage by piggybacking on the towers and service networks of larger providers. They have good phone selections and they save real money. Prepaid phone plans from Cricket Wireless, Straight Talk, Boost Wireless and others start at around $35 monthly, compared to $100 or more for contract-based plans. That’s a savings of about $65 a month, $780 a year, $23,400 in 30 years or $95,000 invested at 8%. Read: Can a Prepaid Phone Plan Save You Money? Lifetime savings for brewing coffee at home: $145,000. It’s hard to see how brewing coffee at home can save much money, but a daily coffee stop at a Starbucks or other coffee shop can really add up. Even a coffee that only costs $2.10 is still pricey compared to the pennies a cup of home brew costs. Two cups per day, five days a week for thirty years costs almost $46,000. We got the $145,000 figure by investing it at 8%.